In the last decade, various whole-cell-based fiber-optic biosensors have been described. All of those reports have shown great potential for their use in agriculture, healthcare, and environmental fields. Genetically programmed to produce a measurable signal (e.g., light emission, changes in color or current), such bioreporters, coupled with fiber-optic transducers, create fast, simple, and easy measurement tools for the determination of contaminant presence, bioavailability, and relative toxicity in tested samples. In this chapter, the advances and drawbacks of whole-cell fiber-optic applications are reviewed, and the critical challenges that need to be overcome to implement these applications in the real world are discussed. From the first whole-cell-based applications proposed by Gary Sayler’s group in 1990 (Harms et al. 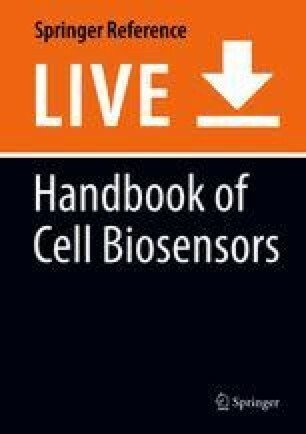 2006), many whole-cell-based biosensors and bioassays have been developed and used in various areas, such as agriculture, environment, and healthcare. In general, conventional analytical approaches (e.g., high-pressure liquid chromatography, gas chromatography–mass spectroscopy, enzyme-linked immunosorbent assay) are more sensitive than biosensors and allow precise detection and determination of the target analytes (Eltzov and Marks 2011). However, their high cost, the requirement for skilled personnel and a well-equipped laboratory, and lack of real-time monitoring capabilities make these approaches unfavorable for many applications. Biosensors, on the other hand, together with operation simplicity, low price, and portability, not only provide sensitive and rapid detection of the target analytes but also do so continuously and in real time. A typical biosensor (Fig. 1) has three parts: a recognition element (e.g., antibodies, DNA, enzymes, microorganisms), a transducer (e.g., amperometric (Ding et al. 2008), potentiometric (Bobacka et al. 2008), voltammetric (Alpat et al. 2008), conductimetric (Lei et al. 2006), optical (Eltzov and Marks 2010), colorimetric (Azevedo et al. 2005)), and an interface (immobilization methods). The principles of measurement by biosensors are based on changes in a biorecognition element during the interaction with a specific analyte and the monitoring of such changes with transducers. Biosensors based on antibodies (Liu et al. 2011; Wingren and Borrebaeck 2006), DNA (Ehrenreich 2006; Petersen and Kawasaki 2007), enzymes (Ansari and Husain 2012), and other proteins (Kricka et al. 2006; Yang et al. 2011) impart a superior level of specificity and sensitivity. However, their applicability is limited by some shortcomings, such as the high cost of macromolecules (purified enzymes, proteins, and DNA), limited detection capability, and the short useable lifetime of the identifying molecules (Gui et al. 2017). In contrast to molecular-based bioreporters, whole-cell-based applications have numerous benefits, e.g., low cost, simple maintenance of growth and viability, reagent-free reactions, no need for pre- or posttreatment steps, low susceptibility to biological contamination, the ability to use large and homogeneous populations, and robustness to a variety of physical and chemical environments. However, the most important benefit of whole-cell bioreporters is that they can be molecularly engineered to provide measurable responses (colorimetric, electrochemical, fluorescent, or luminescent) in a dose-dependent manner. This is achieved by the fusion of a suitable reporter system to a selective promoter (Gui et al. 2017). Furthermore, a combination of strains that are sensitive to different stresses or analytes allows the creation of specific “fingerprints” that will show not only the presence of the toxicants in the sample but also predict their biological effects (Jouanneau et al. 2011). The second part of the biosensor is an interface that links the bioreporter recognition element to a given transducer. Traditional methods for the immobilization of microorganisms include adsorption, encapsulation, entrapment, covalent binding, and crosslinking (Belkin 2003; Bjerketorp et al. 2006; D’Souza 2001a, b; Ding et al. 2008). Even though immobilization strategy usually depends on the chosen bioreporter, some matrix parameters (e.g., durability and stability, their effect on cell viability, specificity and sensitivity, approximation of the fixed cells to the transducer and its effect on diffusion rates) always have to be considered (Collings and Caruso 1997). The transducer transforms the specific bioreporter signals to measurable values, and optical techniques (e.g., fiber optics) are most commonly used in whole-cell-based applications. The key to the success of such sensors is based on their ability to tackle difficult measurement situations where the use of conventional sensors is not suitable. Despite the fact that whole-cell-based approaches allow simple, real-time, and multiple analyte determination in complex media, these technologies are still not ready for commercial use due to the need for highly sensitive devices (e.g., photomultiplier tube (PMT), colorimeter) to detect the cells’ responses and problems with long-term preservation (shelf life). In this chapter, the latest advances in whole-cell-based fiber-optic biosensors are reviewed. Recent research on new bioreporters and technologies for patterning microorganisms on fiber-optic surfaces with various immobilization polymers will be discussed, along with studies of related applications. Also presented is a summary of the potential challenges and future prospects of the practical applications of whole-cell-based fiber-optic biosensors. In the literature, a biosensor is described as a self-contained, integrated receptor –transducer device that can provide selective quantitative or semi-quantitative analytical information and that uses a biological recognition element (bioreceptor) and transducer in intimate contact (Thevenot et al. 2001). The optimal biosensor not only responds to low chemical concentrations but also discriminates target analytes among species according to the immobilized biorecognition elements. The typical biosensor has three major parts: the biorecognition component, the interface (immobilization techniques), and the transducing element (Eltzov et al. 2008). In the first part, bioreporter recognition elements (e.g., whole cells, nucleic acids, immunological molecules (natural or synthetic) and enzymes) are selectively interacted with a target analyte(s) to ensure sensor selectivity (Fig. 1). This chapter will concentrate on biosensors using whole-cell organisms. Electrochemical transducers are widely used in many biosensor applications due to their high sensitivity, compatibility with modern micromanufacturing technologies, portability, disposability, and minimal power requirement (Lei et al. 2006; Wang 2002). The measuring processes are based on the electrical changes produced by whole-cell bioreporter activities (production or consumption of electroactive species) which can be monitored using conductimetric, amperometric, or potentiometric methodologies. In the amperometric-based application, the current generated by the oxidation or reduction of a species at the surface of the electrode (operated at a fixed potential with respect to a reference electrode) is correlated to the biological activity of immobilized cells (Ben-Yoav et al. 2009). Conventional potentiometric-based approaches are based on the changes in potential resulting from ion accumulation or depletion. The signal is correlated to the concentration of the target analyte and is measured with potentiometric transducers as the difference between a working and reference electrode (Simonian et al. 1998; Tran 1993). In whole-cell biosensors, such changes are generated by microbe layers that are immobilized above ion-selective (e.g., pH, ammonium, or chloride) or gas-sensing (e.g., pCO2 and pNH3) electrodes. An additional extremely sensitive electrical whole-cell-based approach measures changes in solution conductance due to microorganism reactions (Lei et al. 2006). Also common is transducer technology based on optical principles, e.g., ultraviolet (UV)–visible absorption, bioluminescence, chemiluminescence, fluorescence, phosphorescence, reflectance, scattering, and changes in refractive index produced by interaction of the receptor with the target analyte (Collings and Caruso 1997; Sergeyeva et al. 2000). The main advantage of this technique is its potential for high-throughput screening, enabling the monitoring of multiple analytes simultaneously (Brogan and Walt 2005). Bioluminescence and fluorescence are the two most widely used technologies in whole-cell-based optical applications. The fluorescent technique is based on differences between excitation and emission wavelengths of fluorescent substances. It can be divided into “in vivo” and “in vitro” types: in the “in vitro” approach, microorganisms change the environment surrounding them and in the “in vivo” approach, reporter molecules (e.g., green fluorescent protein (GFP)) are produced inside bioreporters without any external addition. The bioluminescent sensing technique is based on luminescence emitted by genetically modified microorganisms which respond to the target analyte in a dose-dependent manner. In bioluminescent microbial-based biosensors, lux (the gene encoding luciferase in cells) is the most commonly used reporter system (Marks et al. 2007). The colorimetric sensing technique used with whole-cell biosensors involves the conversion of a chromogen substrate into a colored compound by the metabolic activity of the microbial sensing element (Su et al. 2011). The simplicity and low cost of colorimetric biosensors have led to the development many whole-cell applications (Yagi 2007). The interface in a typical biosensor links the biorecognition elements to a given transducer (Fig. 1). Choosing the optimum strategy for whole-cell immobilization on the transducer surface is a necessary and critical step in the design of biosensors. These techniques not only place the biological layer in proximity to the transducer but they also maintain its activity and sensitivity after immobilization. During sensor operations, the immobilization matrix must remain stable and durable, and provide (in some cases) the possibility for biomaterial reuse (Collings and Caruso 1997; D’Souza 2001a). In the following sections, immobilization methodologies and bioreporters which have been used in fiber-optic applications are further described. The transducer can monitor the light emitted from bioreporters without their intimate contact with the optical fiber, enabling a wider range of noninvasive configurations. Together with geometric convenience and flexibility, fibers can be used to transmit light over long distances. A light guide is not only nonelectrical and therefore free from signal interference and atmospheric disturbances, but it can also carry more information than an electrical wire. The optical fiber can transmit multiple optical signals simultaneously, thereby offering multiplexing capabilities for sensing (Eltzov and Marks 2010). Furthermore, temperature-dependence of the fiber is lower than that of electrodes. The possibility of miniaturization not only reduces the cost of the fiber optics system but also minimizes sample volumes. Smaller volumes result in saving on reagent costs, enable convenient portability and storage, and provide access to difficult areas. The optical fiber’s mechanical properties (e.g., robust and high tensile strength) allow its use in harsh environments. In addition to the high-efficiency coupling of the blue–green region, which is ideal for bioluminescence, SiO2-based optical fibers can be chemically modified when required. Optrode systems are polyvalent, so they can be easily adapted from one whole-cell reporter system to another (Eltzov and Marks 2010). Fiber-optic performance can also be improved with different optimization procedures. For example, the sensitivity of a whole-cell sensor for benzene, toluene, xylene, and ethylbenzene was increased by immobilizing bioreporters on tapered quartz optical fibers. Fiber tapering enables increasing photon-detection efficiency by increasing the number of light sources on its widened end (Kuncová et al. 2016). Light-coupling efficiency can also be optimized by surface modifications, which provide easier adsorption of bioreporter cells at the fiber’s end (Zajíc et al. 2016). Figure 2 summarizes advantages and disadvantages of the fiber-optic biosensors. Living cells contain a large number of enzymes for use in the biosensor as compared to the use of pure enzymes. Whole cells are more tolerant to changes in pH and temperature than purified enzymes. New strains of microorganisms (e.g., bacteria, fungi, yeast, etc.) with unique properties are continually being discovered and isolated from natural sources. Whole cells usually contain all of the enzymes, cofactors, and substrates for the detection of analytes and can therefore be used for real-time monitoring. Whole-cell bioreporters are inexpensive and can be continuously regenerated by regrowing. However, the main advantage of whole cells is that they can be genetically programmed, by recombinant DNA techniques, to produce a measurable response (e.g., light emission, changes in color or current) to specific pollutants or stresses. To achieve this, a reporter gene encoding a protein or enzyme is fused to an inducible promoter taken from prokaryotic (bacteria) or eukaryotic (fungi, algae, animal) cellular-adaptation mechanisms against chemical, physical, or biological stresses. During the triggering process, a regulatory protein recognizes the particular chemical (or physical) stress, and together with response mechanisms activates the promoter, causing the reporter gene to be expressed and to begin synthesis of the reporter proteins. Thus, whole-cell bioreporters not only detect the target analytes in the sample but also determine their biological effects. In many cases, chemicals with dissimilar structures have the same toxic effect; in such cases, the determination of the toxic effect is more important than the identification of the compound (Botana 2014; Marks et al. 2007). There are two main assay types in whole-cell-based optical biosensor systems: constitutive (“light off”) and inducible (“light on”) (Fig. 3). The “light off” system is based on reduction of the naturally high basal expression of the reporter gene due to cell damage. The main problem here is that a reduced signal may be caused by a problem with the bacteria and not the specific pollutant of interest (Eltzov and Marks 2011). In the “light on” scheme, the signal (e.g., changes in color, light, current) is generated by the cells with exposure to the specific trigger (Fig. 3). Such triggers activate the reporter genes that are transcribed and translated to a measurable signal. Thus, understanding the genetic processes behind such responses will enable the selection of specific promoters and creation of bioreporters for specific chemicals or overall toxicity (e.g., genotoxicity or cytotoxicity). Furthermore, the dose dependency (i.e., the intensity of the cell’s response indicates the chemical concentration) of the cell reaction in the “light on” approach makes it more attractive for use in environmental sensing. There are many different reporter systems (e.g., fluorescence with the GFP gene and colorimetric measurements relying on the β-galactosidase (β-gal) gene lacZ), but bioluminescence is still the most widely used approach in the biosensor field (Abbas et al. 2018; Eltzov and Marks 2011; Eltzov et al. 2012; Sharifian et al. 2018). In the bioluminescent approach, the light is derived from bacterial (lux) or firefly (luc) genes’ transcription to the enzyme luciferase, which generates excited-state molecules that, when returning to the ground state, emit light. The quantum yield (i.e., efficiency conversion of chemical energy to light during enzymatic catalysis) of the firefly-based enzyme is much higher than that of the bacterial enzyme (90% compared to 5–10%, respectively (McElroy and Seliger 1963; Meighen 1988)), but it requires an externally added substrate (luciferin) for the reaction, which not only complicates the monitoring process but also increases the final cost of the device (Eltzov and Marks 2010). Bacterial luciferases, on the other hand, express light without any external additions; substrate and enzyme production are controlled genetically by a five-gene operon consisting of the luxA, luxB, luxC, luxD, and luxE genes (luxCDABE) (Fig. 3). The luxC, luxD, and luxE gene products supply and regenerate the long-chain aldehyde, and the luxA and luxB (luxAB) gene products form a heterodimeric luciferase. GFP cloned from the jellyfish Aequorea victoria has also been used as a reporter system in whole-cell-based biosensors. Even though the GFP sensor does not require substrate addition, the requirement for an external light source to activate its fluorescent output makes GFP-based applications much more expensive and technologically complicated than lux systems. On the other hand, GFP-based sensors enable the development of systems based on cells with different light emissions, which allows the creation of multisensing platforms with a different color for each pollutant (Hever and Belkin 2006). Another reporter system is based on colorimetric changes controlled by lacZ genes, which encode the β-gal enzyme. The enzymatic reaction changes the color by hydrolyzing the substrate β-gal disaccharides into monosaccharides. In this case, the most commonly used substrate is O-nitrophenyl β-D-galactopyranoside (Yagi 2007), but others have also been used (Biran et al. 1999; Jain and Magrath 1991). Whole-cell fiber-optic sensors rely on microorganisms to generate a specific signal in response to chemicals or environmental conditions. For more efficient light coupling, the bioreporter should be immobilized close to the transducer. Moreover, the ideal immobilization technique not only fixes cells on the fiber optic but should also be functional at ambient temperature, biocompatible, enable complete retention of the cells, and allow the flow of nutrients, oxygen, and analytes through the matrix. In theory, encapsulated cells should remain viable but not growing (Michelini and Roda 2012). Figure 4 summarizes different immobilization methodologies. In general, microorganism-encapsulation approaches can be divided into chemical and physical concepts (Malan 1992). In the chemical approach, covalent and crosslinkage binding are used to immobilize whole cells on the transducer surface. The microorganisms are attached directly to the transducer surface by stable covalent bonds with functional groups on the cell wall (e.g., amine, carboxylic, sulfhydryl) (Arica et al. 1993; Marks et al. 2007) or by crosslinking with glutaraldehyde (Kumar and D’Souza 2010; Švitel et al. 1998). Even though this methodology allows the creation of a stable bioreporter layer, it is less attractive for biosensors with microorganisms as bioreporters due to decreasing biological activity after exposure to harmful chemicals and harsh reaction conditions. In the physical-based immobilization approaches (e.g., adsorption, encapsulation, and entrapment), both natural (agar, agarose, alginate, and carrageenan) and synthetic (polyacrylamide, polystyrene, and polyurethane) polymers have been used to fix cells. Hydrogels are networks of water-insoluble polymer chains produced in response to various triggers, e.g., ions, heat, light, or other chemicals that will also act as electrophiles. 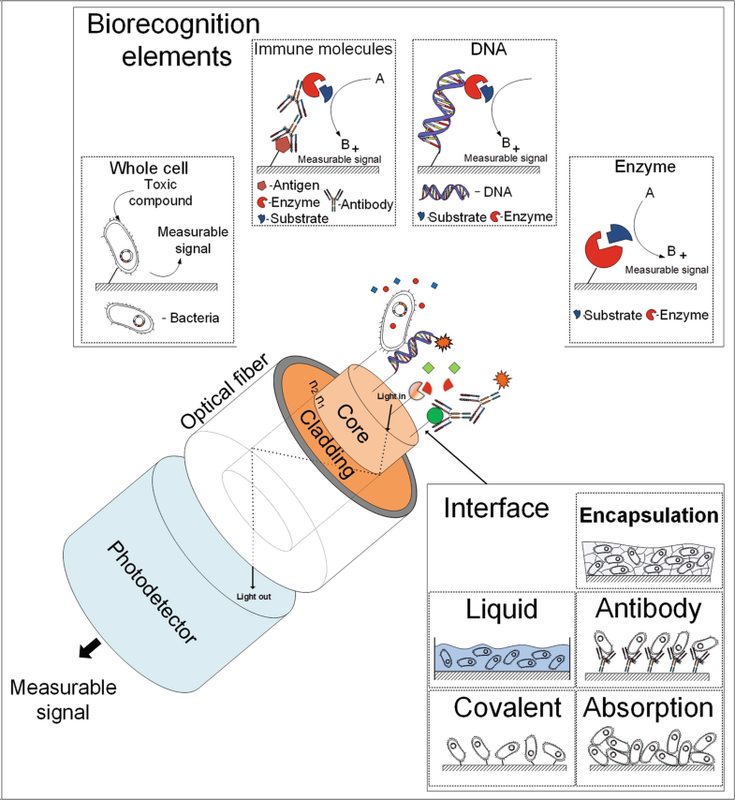 Easily controlled diffusion, high water content, pliability, and biocompatibility make these matrices the preferred choice in many biosensor applications (Elisseeff et al. 2000; Polyak et al. 2000b, 2001, 2004; Urban and Weiss 2010). As in the case of covalent immobilization, the immobilization process should be chosen carefully, due to possible damage effects (e.g., excessive heat or UV light) or a problem with diffusion resistance. A very common class of hydrogel immobilization matrices is alginates (Tombs and Harding 1998). In the presence of divalent ions (e.g., calcium (Polyak et al. 2000b), strontium (Heitzer et al. 1994)), alginates can spontaneously form gels in a single-step process. In addition to the high porosity provided by the open lattice structure and gentle environment (Polyak et al. 2004), alginates may be chemically modified to increase their immobilization properties. Nevertheless, despite several successful chemical modifications – such as coupling with short peptides (Rowley et al. 1999), galactose moieties (Yang et al. 2002), poly(ethylene glycol) diamines (Eiselt et al. 1999), and biotin (Polyak et al. 2004) – alginates are not the optimal choice for the whole-cell-based biosensors. Instability in calcium-poor solutions, deterioration in the presence of phosphate and other calcium chelators, low deformation resistance, and biodegradability have led to the search for alternative encapsulation methods. Another immobilization strategy is based on the incorporation of bioreporter organisms in sol-gels. Sol-gels are hybrid organic/inorganic compounds that bridge between glasses and polymers (Livage 1997). Due to their higher rigidity, thermal and structural stability, and transparency, sol-gel films are widely recognized as suitable tools for optical biosensors. A large variety of living cells, including bacteria, fungi, and animal cells, can be encapsulated using this technology which also extends viability rates (Desimone et al. 2010; Kataoka et al. 2005; Liu et al. 2009; Premkumar et al. 2001b). Sol-gel membranes have also been used in fiber-optics-based applications (Dai et al. 2004; Lin et al. 2006; Pena-Vazquez et al. 2009; Verma et al. 2012). To increase cell viability by eliminating alcohol release during polycondensation processes, some researchers have proposed using aqueous instead of alkoxide precursors for sol-gel formation (Chen et al. 2004). Cell viability can also be prolonged by adding glycerol to the immobilization process (Nassif et al. 2003), or by decreasing formation temperatures (Yu et al. 2005). Entrapment-based immobilization strategies consist of fixing cells in the membranes through different mechanical processes, such as filtration through cellulose membranes (Futra et al. 2015; Wong et al. 2013) or a quartz microfiber filter (Vedrine et al. 2003). There are many other immobilization strategies for optic applications. For example, bacteria can be fixed directly on the end of the optical fiber in wells produced by chemical etching, with each microwell being occupied by only one cell (Biran et al. 2003; Kuang et al. 2004). Several successful reports have been published on bacteria encapsulated in agarose (Alkorta et al. 2006; Bettaieb et al. 2007). The bioreporters can also be fixed in photopolymer-based matrices, where monomer crosslinking is formatted by visible or UV light (Bryant et al. 2000; Koh et al. 2002). However, the harsh chemical initiators required to facilitate membrane polymerization may damage the microorganisms during the immobilization process and reduce sensor efficiency. Another approach suggests immobilizing bacteria with an antibody-modified surface (Premkumar et al. 2001a). Antibody immobilization on various surfaces is very versatile and well developed. Thus, this approach paves the way for cell incorporation on or in virtually any substrate (Premkumar et al. 2001a). Another encapsulation technology, artificial spores, is based on bioinspired layer-by-layer (LbL) biosilification of individual cells (Yang et al. 2013). This immobilization approach mimics bacterial endospore structure by encapsulating individual cells in thin and tough shells in a cytocompatible way. The LbL coating process enables surface-functionality, which is useful in color identification and site-selective immobilization of encapsulated cells into optical devices (Yang et al. 2013). The LbL coating process has been studied for the deposition of nanomaterials, such as magnetic nanoparticles that facilitate cell separation by a magnetic field and functional coating of optical fibers (Korposh et al. 2013). In this section, recent advances in whole-cell fiber-optic bioassays for the detection of target toxicants in the air, soil, and water are described (Table 1). Today, the main factor limiting the application of bioreporters is the fact that they are genetically modified, and their use outside authorized laboratories is strictly regulated in developed countries such as those of the EU and the USA (EU 2009). A safe drinking-water supply is crucial to human life, and drinking water should certainly not carry any risk for humans (WHO 2011). Therefore, there is a significant need for biosensors that will allow continuous and rapid water-toxicity measurements without any additional pretreatment. Heavy metals, which are released into environmental water sources (e.g., surface, ground and sea) through natural processes and anthropogenic activities, pose a significant health risk and their toxicity is an increasing problem with respect to ecological, evolutionary, nutritional, and environmental aspects (Jaishankar et al. 2014). Different whole-cell-based fiber-optic technologies have been proposed for the detection of heavy metals in water. For example, a fluorescence-based fiber-optic toxicity biosensor based on Escherichia coli genetically modified with GFP was developed to evaluate the toxicity of common heavy metals (Futra et al. 2015). The biosensor response was stable for at least 5 weeks, and the detection limits for Cu(II), Cd(II), Pb(II), Zn(II), Cr(VI), Co(II), Ni(II), Ag(I), and Fe(III) with the proposed application were 0.04, 0.32, 0.46, 2.80, 100, 250, 400, 720, and 2600 μg/L, respectively (Futra et al. 2015). Another GFP-based approach used E. coli strain DH5α (pNV12) to detect different combinations of Pb(II), Cd(II), and Zn(II) ions in milk samples (Kumar et al. 2017). The working principle of the biosensor was based on the expression of a GFP gene under the control of the cad promoter and measurements of the bioreporters’ fluorescence responses with a fiber-optic spectrofluorometer. A good linear range for cadmium ion concentrations of 10–50 μg/L was obtained with a detection limit of 10 μg/L (Kumar et al. 2017). In another application, differences in the fluorescence emission (before and after exposure) of Anabaena torulosa allowed quantitative and qualitative detection of heavy metals (Cu, Pb, and Cd), and pesticides (2,4-dichlorophenoxyacetate (2,4-D), chlorpyrifos) (Wong et al. 2013). In this case, the bioreporter was entrapped on a cellulose membrane through filtration, dried and fixed in a cylindrical well attached to an optical fiber. The biosensor showed good sensitivity, with the lowest limits of detection for Cu, Pb, Cd, 2,4-D and chlorpyrifos determined at 1.195, 0.100, 0.027, 0.025, and 0.025 μg/L, respectively. This device was also tested with different combinations of toxicants, resulting in predominantly antagonistic responses (Kumar et al. 2017). Another application took advantage of the effect of heavy metals on chlorophyll a fluorescence intensity of the microalgae Anabaena flosaquae, Chlorella vulgaris, and Euglena gracilis. In the first step, the effects of Cd(II), Pb(II), and anthracene were studied on yeast, while complementary ATP-metry measurements demonstrated a direct relationship between the optical response and pollutant toxicity, in a cell- and dose-dependent manner. 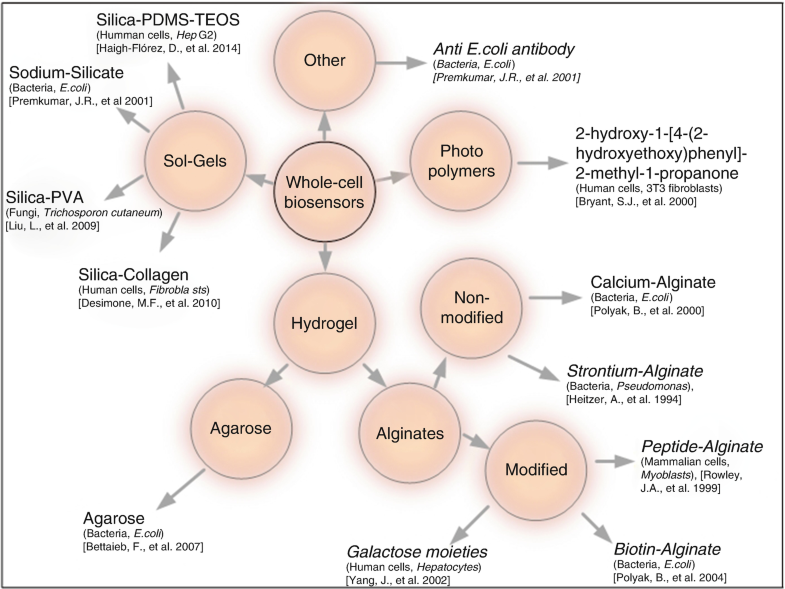 Then, cells were encapsulated in silicate–colloidal silica nanocomposite matrices and exposed to heavy metals (Ben Ahmed et al. 2018). For on-site analysis of arsenite and zinc in complex matrices, for example, serum and freshwater samples, a sensing system based on a microfluidic compact disc with immobilized whole-cell spores was proposed (Michelini et al. 2013). The flow device was coupled with a fiber-optic-based detection system and fluids were mixed by centrifugal pumping. Results were comparable to those obtained with the same assay performed in a conventional microplate format, but the application required relatively long incubation times (150 min), and the spores needed to be properly activated to recover their sensing capability, likely representing the main disadvantage of such systems (Michelini et al. 2013). Other toxicant groups (e.g., pesticides, herbicides, and fungicides) reach the ground or surface water by leaching or runoff following normal agricultural practices, or by accidental (or deliberate) spills. In the latter case, large quantities can enter the surface water, leading to high concentrations (van Leeuwen 2000). Because of their toxicity, these chemicals are considered to be a particular health hazard for the general population and should therefore be continuously monitored in the water. Different whole-cell-based biosensors have been developed for these issues. For example, herbicides were detected by kinetic changes in chlorophyll fluorescence in Chlorella vulgaris cells (Naessens et al. 2000). Cells were immobilized on removable membranes and placed in front of the tip of an optical fiber bundle. The proposed device measured the concentration of a toxic chemical in the form of a single drop or dissolved in a continuous flow. The detection of 0.1 μg/mL of a single herbicide, as required by EC legislation for drinking water, was possible with this algal biosensor, especially for atrazine, simazine, and diuron (Naessens et al. 2000). In another application, herbicides were monitored with microalgae encapsulated in a matrix of sodium silicate and glycerol. The matrix with the cells was placed at the tip of a bifurcated fiber-optic cable in a flow-through cell, and chlorophyll fluorescence increased due to photosystem destruction by the herbicide. The biosensor worked at concentrations of 0.5 μg/L to 10 mg/L of herbicide with a partially reversible response (Pena-Vazquez et al. 2009). The same authors used microalgae to construct an fiber-optic device for monitoring copper in reservoirs and water supplies (Peña-Vázquez et al. 2010). Specificity to pesticides may also be achieved by manufacturing a fiber-optic dual-head device containing both analyte-sensitive and analyte-resistant microalgal species (Haigh-Flórez et al. 2014). Dictyosphaerium chlorelloides was immobilized in porous silicon films and presence of the target analyte was monitored through changes in O2 concentration, where herbicide decreased O2 production in the analyte-sensitive immobilized strain without affecting the analyte-resistant population’s response. The biosensing device provided in situ measurements of the herbicide concentration every 180 min with a 12 μg/L limit of detection and a 50–800 μg/L working range. The main disadvantage of this approach is lack of specificity: any other pollutant might also decrease O2 production of both strains (Haigh-Flórez et al. 2014). For detection of methyl parathion (an organophosphate pesticide and insecticide), Flavobacterium was trapped in a glass-fiber filter and used as a bioreporter in a fiber-optic system. The measuring process was based on methyl parathion’s hydrolysis with organophosphorus hydrolase enzyme into the detectable product p-nitrophenol. The disposable, simple, and cost-effective biosensor enabled sensitive (0.3 μM) methyl parathion determination in a single step with high reproducibility and uniformity (Verma et al. 2012). As already noted, the main advantage of the whole-cell-based bioreporters is their ability not only to detect chemicals in water but also to determine their toxic biological effect. In many cases, no toxicological information is available for the chemicals. Therefore, whole-cell-based applications can be used as tools for the assessment of the potential toxicity of unidentified substances to avoid delays in their risk assessment. For example, due to the potential carcinogenicity of acrylamide, formed by Maillard reaction from free asparagine and a few other amino acids, there is a demand for L-asparagine monitoring in food (Verma et al. 2012). Coliform bacteria isolated from a wastewater sample from Fortis Multispecialty Hospital, Mohali, India, and immobilized with an indicator in sol-gel onto circular plastic discs adjusted to a an optical fiber were used for L-asparagine monitoring in different food samples. The measurement process was based on changes in the absorption spectrum caused by L-asparagine hydrolysis with the bacterial enzyme asparaginase. The novelty of that study lay in its describing the first-ever application of a fiber-optic approach to analyze asparagine, with minimization of the sample volume to 5 μL, a response time of 7 min and a detection limit of 1 nM (Verma et al. 2012). Another device was developed for real-time monitoring of 1,2-dichloroethane (DCA) in aqueous solutions (Campbell et al. 2006). DCA is one of the most widely used halogenated organics, and it has been released into the environment and contaminates groundwater at many hazardous-waste sites. In this application, Xanthobacter autotrophicus strain GJ10 was immobilized in calcium alginate on the tip of a fiber-optic fluoresceinamine-based pH optode. Together with a fast response time (8–10 min) and measurement reproducibility (SE <9%), the biosensor could quantify DCA at 11 mg/L and showed a linear response up to at least 65 mg/L. The sensor’s small size, the potential for remote operation, and its low cost warrant its further development (Campbell et al. 2006). Optical fibers can be used as a connecting unit between measurement parts (with immobilized bioreporters) of the sensor and photodetectors. This technology was used to couple a cooled CCD sensor with a 4 × 3 multiwell cartridge with different bioreporters (e.g., Saccharomyces cerevisiae to test androgenic compounds, an E. coli strain sensitive to the lactose analog isopropyl β-D-1-thiogalactopyranoside) to measure the toxicant at nanomolar levels with good precision and accuracy (Roda et al. 2011). Using a similar approach, a microfluidic unit with a Magnetospirillum gryphiswaldense strain was coupled with a cooled CCD for quantitative water-toxicity monitoring (Roda et al. 2013). In general, toxicity biosensors consisting of bioluminescent bioreporters (e.g., Aliivibrio fischeri encapsulated in various matrices, such as alginate or sol-gel) show better performance in terms of limit of detection, linear response range and response time than amperometry (Campanella et al. 1995), microplate reader luminometry (Corbisier et al. 1999), luminometry (Ivask et al. 2004), and quartz-cuvette spectrofluorometry (Bondarenko et al. 2008) transducers with various types of recombinant microorganisms. For example, A. fischeri encapsulated in alginate microspheres coupled to an optical fiber was used to detect heavy metals in water (Futra et al. 2014). The loss of bioluminescence response from this bioreporter corresponded to changes in the heavy metals’ toxicity levels. Inhibition of the luminescent biosensor response was found to be reproducible and repeatable within the relative standard deviation range of 2.4–5.7%. Furthermore, alginate encapsulation methodology prolonged the bioreporters’ metabolic activity (to up to 6 weeks) without any noticeable change in the bioluminescence response (Futra et al. 2014). This technique used the “turn off” approach, where light intensity decreased with exposure to the toxicant. The main disadvantage of these applications is the lack of specificity. Therefore, many researchers are using “turn on” approaches to measure water toxicity in static (Hakkila et al. 2004; Polyak et al. 2000a, 2001, 2004) or flow-through (Eltzov et al. 2009a, 2015b) modes. In the static applications, samples are taken to the testing chamber from the main source. The main disadvantage of this approach is the possibility that, at the moment of water collection, the toxicant will not be in the collected sample (e.g., in flowing water, such as rivers, tap water, where exposure to the pollutant may be time-dependent). In the flow-through devices, direct connection of the biosensor to the main water source allows continuous and real-time toxicity monitoring (Eltzov et al. 2009a). An optical fiber with alginate-immobilized bacteria placed in tap water showed the ability to continuously monitor the presence of toxic compounds in a dose-dependent manner, where increasing pollutant concentration increased the light response of the bioluminescent bacteria. Further optimization procedures (e.g., redesign of the fiber probe holder and flow unit cell, modulation of bacterial medium concentration to increase bioreporter performance while keeping biofouling in check) increased measurement duration and sensitivity (Eltzov et al. 2015b). Another application made use of the same bioreporters immobilized in a sol-gel on either an optical fiber or a glass slide, for real-time monitoring of water toxicity in the Netherlands (Woutersen et al. 2017). However, due to the higher sensitivity and robustness of the glass slides, only these were used in the field. The sensor responded to spikes in genotoxic compounds in the water with a minimum detectable concentration of 0.01 mg/L mitomycin C in the laboratory and 0.1 mg/L in the field. With further optimization, which should include a reduction in daily maintenance, the sensor has the potential to become a useful addition to the currently available biomonitors (Woutersen et al. 2017). Continuous toxicity monitoring may also proceed with bioreactor-based biosensors, in which the optical fiber transfers the bioluminescence activity from the chamber with liquid bacterial culture to a PMT. This system consists of four channels arranged horizontally inside a cylinder, with each channel having two small bioreactors (culture reactor and test reactor) that are vertically connected to each other to maintain their separation. Such separation provides stable and continuous sensor performance, while small working volumes enable long operation times. Dose-dependent responses of the four tested bioreporters were observed for all tested toxicants (Lee and Gu 2005). Although prokaryotic bioreporters enable the development of simple and inexpensive biosensors, their inability to respond to specific nonsystemic toxic effects of compounds such as genotoxicants and endocrine disruptors limits their predictive value for possible hazards for humans. For this reason, human lung cells as the cladding of a chalcogenide glass fiber were used as bioreporters for toxicant determination in water. Chalcogenide glass fibers are used to perform remote infrared analyses in a fiber evanescent wave spectroscopy system, while the sensor monitors the response of live cells to toxins by detecting a change in their infrared spectrum. This technique not only allowed detection of toxicants in the sample but also informed on their biological effect (genotoxic or cytotoxic) (Lucas et al. 2006). Despite the immense progress in biotechnology and genetics that has allowed constructing whole-cell biosensors for any pollutant, the soil remains the most extreme natural system to be studied with these biotechnological analytical tools and thus far, no universal test has been developed (Renella and Giagnoni 2016). Whole-cell applications have been used to monitor the presence of various bioavailable heavy metals (e.g., arsenate (Petänen et al. 2003; Turpeinen et al. 2003), mercury (Fu et al. 2008), cadmium (Ivask et al. 2004), or copper (Brandt et al. 2006)) in soils or sediments. However, none of these devices are portable due to complicated measurement protocols and the requirement for expensive equipment. To create a portable field device, bioreporters were coupled with an optical fiber and used to monitor mercury and arsenate in soil samples (Ivask et al. 2007). The proposed application enabled quantification of environmentally relevant concentrations of the target analytes (2.6 μg/L of Hg(II) and 141 μg/L of As(V) or 18 μg/L of As(III)), and the importance of direct contact of the bacteria with the soil analytes was also demonstrated (Ivask et al. 2007). The fiber-optic-based application might also be used as a tool for understanding the influence of physicochemical conditions in the subsurface environment on microbial activity during biodegradation processes. Based on this concept, a novel fiber-optic detection system was developed that employs a bioreporter organism carrying lux (Dorn et al. 2004; Yolcubal et al. 2000) or gfp (Hewitt et al. 2012) to noninvasively monitor real-time, in situ microbial activity in porous media. This system not only examines the relationship between microbial activity and the resultant impact on biodegradation but also the transport of toxicants in porous media. The results indicated that the fiber-optic system can be used to monitor microbial activity under dynamic conditions, and that it provides a better understanding of how physicochemical conditions in the subsurface influence microbial activity. In the last two decades, acceptance of the notion that homes and office buildings are free of health-damaging pollutants has changed. For example, Americans alone spend approximately 22 h indoors every day. Such long exposure to chronic low levels of indoor air-conditioning pollutants may put many susceptible individuals at much greater risk for adverse health effects (Bernstein et al. 2008), mainly related to their exposure to low-level air pollutants that are generally not identified as a specific cause or compound (Mølhave 2003). In light of the obvious need for real-time air-pollution monitoring, a whole-cell fiber-optic biosensor for air-toxicity monitoring was proposed (Eltzov et al. 2011). 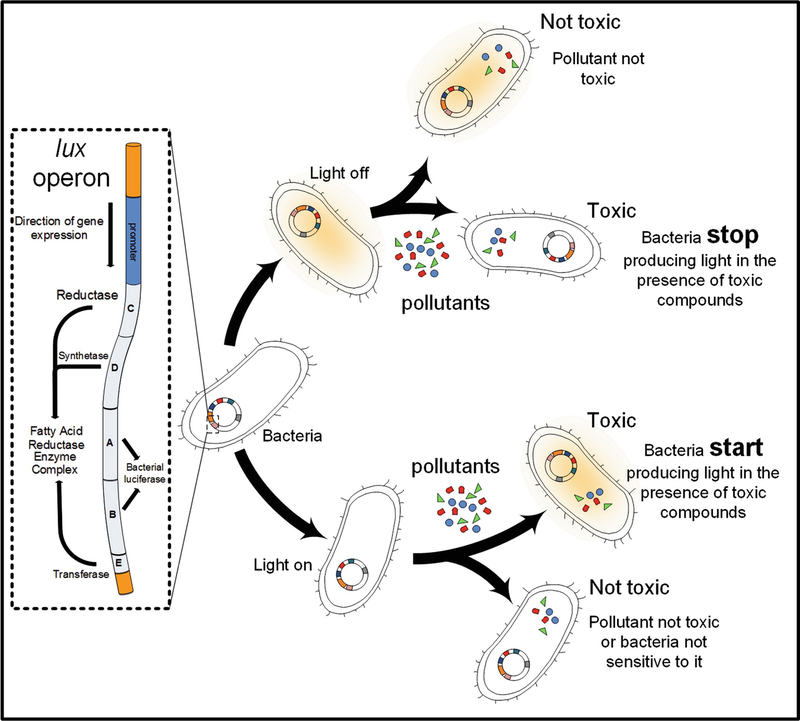 Bioluminescent bacteria were immobilized with alginate on the proximal end of an optical fiber and exposed to different air pollutants (e.g., chloroform, toluene and compounds originating from paints). The sensor was able to show pollutants via differences in the strength and shape of its bioluminescent responses (Eltzov et al. 2011). As a continuation of that work, a new approach for monitoring air toxicity was proposed consisting of a biosensor with both nondisposable (photodetector and liquid light fiber optics) and disposable (calcium alginate pads with immobilized bacteria) elements (Eltzov et al. 2015a). After optimization steps (e.g., pad orientation, temperature, and time of exposure), bacteria were exposed to different chemicals (e.g., organic solvents), including commercially available compounds that may be found in an indoor environment (e.g., cigarette smoke, acetone, paints, etc.). All tested air pollutants not only induced or inhibited cell bioluminescence, but the changes were both dose-dependent and distinct for each pollutant. This prototype represents a first step toward the creation of a simple, sensitive, and user-friendly device that will allow continuous monitoring of air toxicity. Further miniaturization of the setup, increased measurement periods, and the addition of wireless capabilities will allow creation of a commercial remote product (Eltzov et al. 2015a). In this chapter, various fiber-optic methodologies coupled with different bioreporters were described. In the last few decades, whole-cell-based biosensors have become extremely attractive due to their cost-effectiveness, sensitivity, simplicity, and fast response time. Together with increasing commercial availability of various optical fibers and fiber-optic elements, the field has been opened to new biosensor designs and applications. The operational capability of such devices is critically dependent on the ability to keep the immobilized bioreporters viable and active. Thus, development of new immobilization matrices with more favorable parameters (e.g., better functioning under a wider range of temperatures, biocompatibility, increased diffusion rates, mechanical stability) will provide more stable and suitable environments for immobilized cells and contribute to long-term storage considerations. Effective immobilization might also overcome the restrictions to wider utilization of genetically modified organisms (GMO) (especially bioluminescent or fluorescent bioreporters) used in fiber-optic applications. Future studies should not only optimize the immobilization approaches to prevent GMO escape into the environment but also expand our knowledge of their environmental spread and related risks. Development of nanotechnology will also contribute to the sensitivity and productivity of whole-cell-based fiber-optic biosensors. Addition of nanostructured materials to immobilization matrices will enhance the microorganisms’ responses (e.g., bioluminescence (Eltzov et al. 2009b)) and increase their sensitivity. Together with optimization and automation of the measurement processes, future improvements should focus on miniaturization and providing real-time monitoring capabilities to the fiber-optic applications. Decreasing the cost of the instrument parts and additional communication capabilities will allow the creation of sensor networks for more efficient measuring. Such optimization will not only create more precise contamination warning systems but it will also allow localization of the toxicity events for more efficient isolation and treatment procedures. The main disadvantage of fiber-optic biosensors is their inability to measure several compounds at once. Thus, future effort should focus on providing optical devices with multitasking capabilities (i.e., simultaneous monitoring of several target analytes in the same measurement step) in both static and flow-through modes. In summary, rapid advances in the fiber-optic and whole-cell fields have allowed the creation of many different biosensors. However, many problems still need to be solved before these applications can become commercially competitive with currently used analytical tools. This research was supported by the Chief Scientist of the Israeli Ministry of Agriculture (grant #16-10-0003). This manuscript is contribution number 8171/18 from the Agricultural Research Organization, the Volcani Center, Israel.